It IS the best picture of an Ellebobarkianda I have ever seen! Bar none. Well done, Quinn. Great imagination and talent!! Good job Quinn. THAT IS THE BEST DRAWING OF AN ELLEBOBARKIANDA THAT I HAVE EVER SEEN! Those are some great pictures! The details are very impressive!! I can't decide if my favorite is the Ellebobarkianda or the catgoyle. Has Quinn checked out the gargoyles at the National Cathedral? My favorite parts of the Ellebobarkianda are the face and the panda tail. Those parts have especially great details! I like how colorful the picture is too. Awesome painting, Quinn! Not only is it a fantastic picture of an Ellebobarkianda, but I really love how you came up with the name. FANTASTIC! Really AMAZING. I LOVE the ellebobarkianda! What imagination and intelligence that required. And I'm glad you published the great catgoyle, too. Looking forward to seeing more from Quinn. These are awesome pictures! What a great display of artwork! Quinn, excellent work! :) Wow! 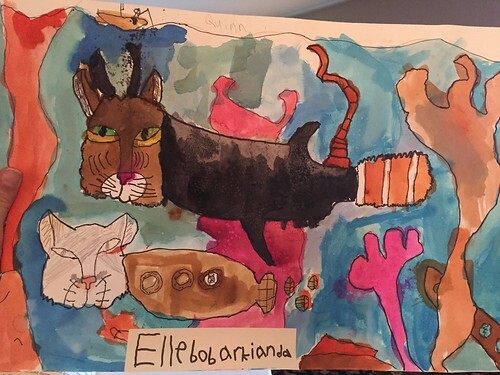 OK, while I'm not qualified to rate artwork, those cat faces are beautiful, and the overall composition is very creative. If the medium was watercolor, then it's even more impressive! Do you know how difficult watercolor is? The face! And the colours! It's gorgeous - talented child! Fantastic drawing and painting. There is a future in visual art for that boy! Helps to have a great imagination. Keep up the drawing, practice every day! Try drawing or painting with your "wrong" hand, too. It will use a different part of your brain, and will be better at some kinds of art. My right hand is better at writing and small, precise details, but my left hand is better at shapes and outlines. You are a very talented artist!! I LOVE your ellebobarkianda! It is a truly wonderful creature. Your sense of color and imagination are extraordinary. Please keep posting your artwork. I can't wait to see what you will do in the future. 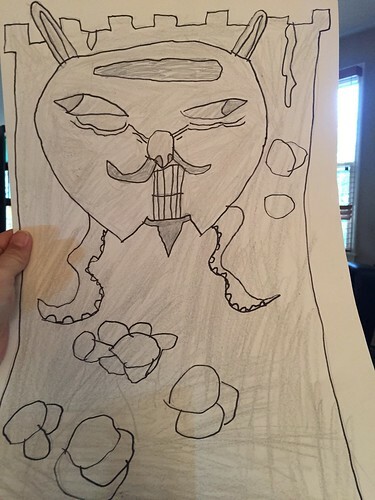 I totally dig Quinn's artwork. I echo the other sentiments! 10 out of10. Wonderful art, and both would make fantastic illustrations for books.